We offer Special Purpose Rubber Products which are used for various industrial purpose. These products are manufactured using high quality raw material following highest quality norms. We manufacture and export a wide range of special purpose rubber products which are extensively serving the demands of varied industries like automobile, chemical, construction and many others. 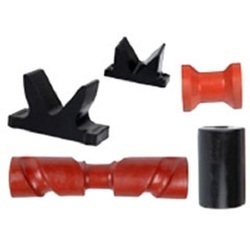 Fabricated using the finest quality rubber, these are known for high tensile strength, expansion resistance, contraction resistance and better durability. Further, we also quality test these products on various quality parameters to meet the international industrial standards.